Infrared light sensor is a light sensor that only responds infrared light change. Infrared light sensors are generally in the form of photo transistors or photo diodes. Where if the infrared light sensor receives infrared light then the output terminal will provide a change in resistance. However, there is also a light sensor that has been made in the form of an infrared sensor receiver IC chip as used on television remote receivers. Where this infrared sensor IC chip will provide an output voltage change if the infrared sensor IC receives infrared light emission. Phototransistor is a transistor that has resistance between the collector’s foot and the emitter can change according to the intensity of the light it receives. Photo transistors have 2 output terminals with the name of emitter and collector, where the emeitor and collectivity values ​​will be lower if the intensity of light received by transistor photos is higher. Photo diodes are diodes that will change resistance at the anode and cathode terminals when exposed to light. The anode and cathode resistance values ​​in the diode photo will be lower if the light intensity received by the photodiode is high. The following is the shape of the infrared sensor IC. Difference Between Photodioda Phototransistor. lies in the current gain (Beta dc). If the two devices are given the same amount of light intensity, the phototransistor will produce a current (Beta dc) greater than the photo diode. The addition of the sensitivity of the phototransistor is a big advantage to the photodiode. 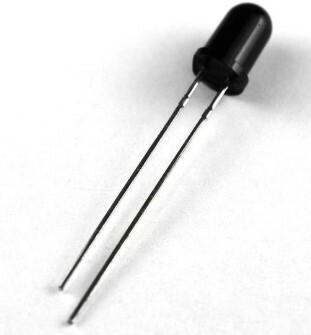 Phototransistor when used in an application combined with other transistors where the output of a photo transistor is the base input for the next transistor, because in its application photo transistors require a very large reinforcement or better known as photo darlingtons. the photodioda will experience a change in resistance when receiving light intensity and will flow electric current forward as a diode in general. A photodiode sensor is a type of photodetector sensor. Another type of light sensitive sensor that is often used is the phototransistor. Photodioda will flow current which forms a linear function of the intensity of light received. This current is generally regular against power density (Dp). The comparison between the output current and power density is called the current responsitivity. The current in question is a leaky current when the photodioda is illuminated and in a state of being backed up. The higher the sensitivity of a phototransistor, the lower the speed. Phototransistor is more sensitive than photodiode, but phototransistor cannot hydrate and die quickly like a photodioda. For example, a photodiode that has a special output current in the microampere order can live and die in the nanosecond order, whereas a phototransistor that has a special output current in the miliampere order, but can live and die in order of microseconds.